Was I just not paying close attention, or were the media observances of Ray Bradbury’s death at 91 this June pretty subdued? Some old guy in California croaked; don’t worry, no Kardashians were harmed. That’s the kind of thinking I fear goes on in what newsrooms remain operational these days. One of the most heartfelt tributes to the fantasy-oriented author-poet-playwright hailed from local novelist Les Roberts on his website www.lesroberts.com; I urge all to read it who know of Ray Bradbury as more than just someone whose stuff you had to ingest in school. For myself, I can only say that when I was a young lad a next-door neighbor girl, Rita, gave me a paperback of The Martian Chronicles as a Christmas gift. She was almost apologetic about it; she had no idea what I wanted and just grabbed the first book on the rack at the drugstore. Needless to say, the book (which was not a homework assignment) held me absolutely spellbound, and I’ve always been grateful to her. I expect that if any cinematic tribute to Bradbury appears on our screens, probably at the Art Museum or the Cinematheque, it will be a revival of Truffaut’s 1966 adaptation of FAHRENHEIT 451. Ewing was just knighted by the French, so his hands were tied, no doubt. But were I to have any say about Cinematheque programming (and the venue, hit by plummeting ticket sales, would soon be deader than Ray Bradbury), I would point to another title as the best-ever screen transmutation of the notoriously tough-to-visualize author. 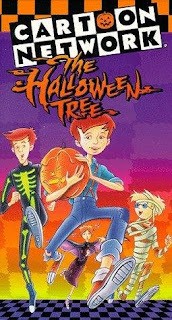 It’s 1994’s THE HALLOWEEN TREE, a direct-to-video release from Hanna-Barbara Studios. Say what? Yes, the same cartoon assembly line that gave the world the Flintstones and the Jetsons pulled off a minor miracle, in my opinion. Director Mario Piluso’s feature is a well-rendered, intelligent phantasmagoria that follows Bradbury's 1972 novel quite closely but stands on its own merits. grotesque old man named Carapace Clavicle Moundshroud, who proposes to help the children retrieve their friend while touring the historical roots of Halloween. SOMETHING WICKED THIS WAY COMES, THE ILLUSTRATED MAN, A SOUND OF THUNDER, the made-for-TV MARTIAN CHRONICLES and other futile feints at the writer's descriptive sorcery. While Hanna-Barbara's repute rests on a cheapo drawing techniques heavily reliant on simplified lines and Xeroxed cels, THE HALLOWEEN TREE is no quickie. Background paintings are rich and detailed, and the circus-poster "October kite" that transports the kids to distant realms is particularly memorable. all like his famous role as the emotionless alien Spock. Moundshroud also underscores that THE HALLOWEEN TREE offers something rare indeed in the often hackneyed scripts of “family” features, an ambiguous villain who isn't even defeated in the end, but accommodated. 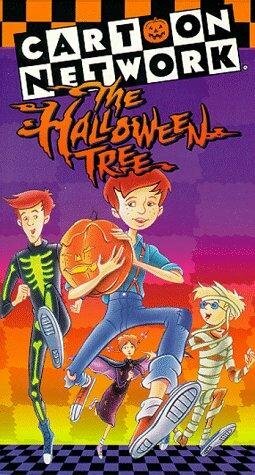 It would be treat, not a trick, to see THE HALLOWEEN TREE on the big screen. I don’t know that it will ever happen though. In any case, thanks for the inspiration, Mr. Bradbury, thanks for the film, Mr. Piluso, thanks for the tribute, Mr. Roberts, and thanks for the book, Rita.